ICON is a free Web App for dealing with issues online. Designed by teens to offer you a first step to working out your options and next steps. ICON (In Case of Online Negativity) has been developed, designed and tested by teenagers from all across New Zealand. Available through any web browser at www.icon.org.nz it is a clear, easy to use web tool to help teens explore options and troubleshoot online negativity-from nudes, to cyberbullying as well as hate & abuse and practical tips for taking charge of your time online. ICON has been co-designed with and driven by young people to be a tool that gives young people honest, practical and relatable strategies. The average teen spends at least two hours online every day and most of the time this is positive. ICON provides a non-judgmental, easy and intuitive option when things do go wrong; so that decisions can be made to move forward and get on with life. 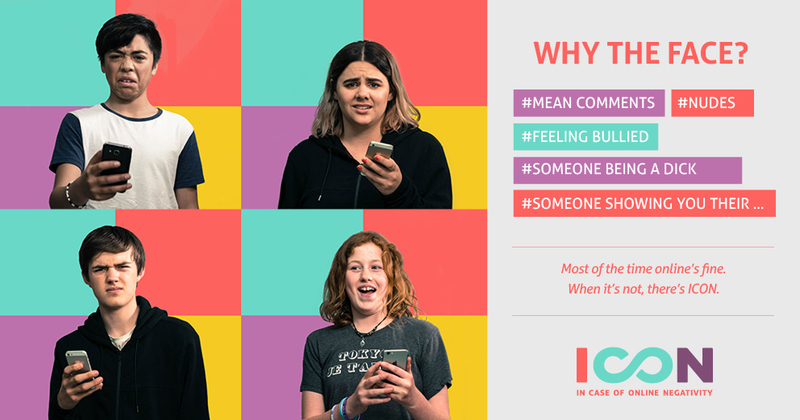 ICON is a starting point for teens experiencing online negativity, who are not sure where to go for help or where to start. It is not an alternative or replacement for the incredible services already available throughout NZ. ICON points you in the direction of the tools and services that are available (that you might not know about). In 2016, when Keryn Tubbs was 17, an anonymous Instagram page was set up at her High School to embarrass other students. ‘Nudes 101’ shared photos sent privately on a public page and it go a lot of attention. As a senior member of Sticks ‘n Stones, a youth led bullying prevention group, a lot of her peers turned to her for help and advice. She was able to get the page taken down and offer support to the students who had photos shared. This got her thinking. She worried about what other teens did when they did not know where to start to deal with online hate, negativity or harm. While presenting at a conference, Keryn heard about an Australian App supporting Outback Nurses with bullying. This re-sparked her idea and she started planning what an app for teens could look like that would be developed by them, for them. Keryn wanted an online version of a Sticks ‘n Stones Member that could give relevant information for someone who felt helpless to make their own choices about what to do next. A survey the team had done of almost 1500 young people had also found that 48% of those who had been bullied in the previous six months had not told anyone what was going on and not reached out for help from anyone. There needed to be something else. Along with her High School advocate team, they started exploring what help was already out there. Google searches gave pages and pages of results that were general and written mainly for adults. “We felt really judged and embarrasses” says Keryn, “and we were not even dealing with issues. We thought there had to be something we could do that would be different and could help someone to not feel so helpless”. Keryn started creating a plan for what would become ICON (IN Case of Online Negativity) and with the support of other SnS members, she successfully applied for funding from the Vodafone foundation to create a prototype of her idea. From there, she applied to the Netsafe Partnership Fund and has led a team of teens from right across NZ to make ICON a reality. Support from Netsafe's Online Safety Partnership Grant helped us to take the ICON prototype we had created and devleop it into a full web app. The Netsafe team have been incredible and we are really grateful for their ongoing support. The Vodafone NZ Foundation supported the development of our ICON prototype through their inaugural Technology Grant late in 2016. The Vodafone Foundation team are phenomenal and their belief in Keryn's initial idea and the potential it had opened the door in making ICON possible. Keryn is now a second year law student at Victoria University. 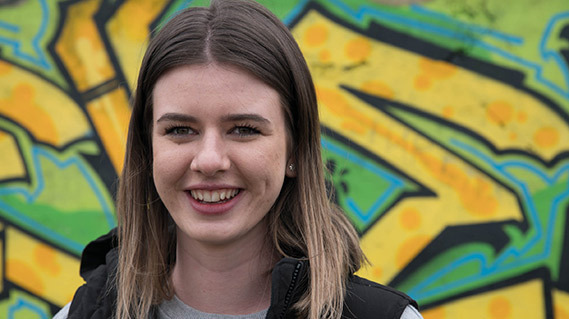 She was a founding member of Sticks ‘n Stones and her leadership work was recognised with a range of awards including: NZ Youth week leadership Award, NZer of the Year Local Hero Medal as well as being a Youth MP in 2016 and presenting at international conferences in Australia and Ireland. Keryn developed her idea for an ‘online version of a SnS member’ and has project managed the development of ICON in partnership with her team and SnS CEO to get funding and make it a reality.